-"'Thus says the LORD to Cyrus His anointed, Whom I have taken by the right hand, To subdue nations before him and to loose the loins of kings; To open doors before him so that gates will not be shut: 2 'I will go before you and make the rough places smooth; I will shatter the doors of bronze, and cut through their iron bars. 3 And I will give you the treasures of darkness And hidden wealth of secret places, So that you may know that it is I, The LORD, the God of Israel, who calls you by your name.'" (Isaiah 45:1-3 from the NASB) Dated 740-680 B.C. Isaiah prophesied Cyrus' name and what he would do over 100 years before Cyrus existed as a ruler. The return to the land of Israel and the rebuilding of the building of the temple in Jerusalem began about 538 B.C. 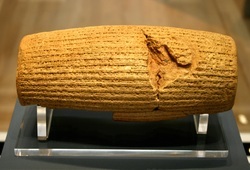 From: Cyrus Cylinder photograph is presented with permit from Wikipedia 3-26-13. "Front view of a barrel-shaped clay cylinder resting on a stand. 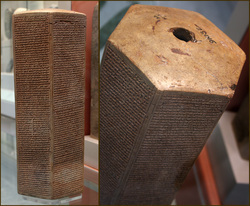 The cylinder is covered with lines of cuneiform text. Prioryman - Own work Front of the Cyrus Cylinder CC BY-SA 3.0"
Epic of Gilgamesh Tablet 11-a copy of a Flood Story produced during the time of Asurbanipal, 650 B.C. at Ninevah. At British Museum. (Image from Wikipedia 3/2013 with permission). col. 1, line 21-24 "...make a ship after this...I destroy? the sinner and life...cause to go in? the seed of life all of it to go into the midst of the ship." col. 1, line 39-40...the flood which I shall send you, into it enter and the door of the ship turn." col. 2, line "I entered to the midst of the ship and shut my door." col. 3, line 1-3 "the surface of the earth like...it swept, it destroyed all life from the face of the earth...the strong deluge over the people, reached to heaven." col. 3, line 19-28 "Six days and nights passed, the wind, deluge, and storm, overwhelmed. On the seventh day in its course was calmed the storm, and all the deluge which had destroyed like an earthquake, quieted. The sea he caused to dry, and the wind and deluge ended....like reeds the corpses floated. I opened the window, and the light broke over my face, it passed...."
col 3, line 32- 33 "To the country of Nizir went the ship; the mountain of Nizir stopped the ship,..."
col. 3, line 38- 46 "I sent forth a dove...I built an altar." From the Chaldean Account of Genesis, by George Smith 1876, Scribner, Armstrong and Co., NY. This account, written in cuneiform has key points similar to the Genesis Account of the Flood. However, it contains a less precise timeline and the multiple gods with good and bad qualities are in contrast to the characteristics portrayed with the majesty of the One Holy Righteous Jewish/Christian God. It, the Epic of Gilgamesh, lacks the precision of a true eye witness account. 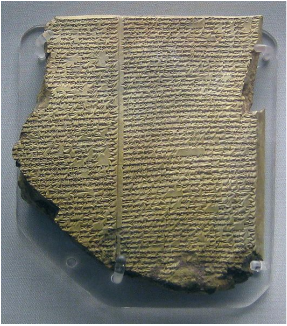 There are other flood tablets as well (see JGL dissertation on this web site). In the BIBLE 2 Kings 18:13, "Now in the fourteenth year of king Hezekiah did Sennacherib king of Assyria come up against all the fenced cities of Judah, and took them. And Hezekiah king of Judah sent to the king of Assyria to Lachish, saying, I have offended; return from me: that which thou puttest on me will I bear. And the king of Assyria appointed three hundred talents of silver and thirty talents of gold. And Hezekiah gave him all the silver that was found in the house of the king's house"....Sennacherib was apparently not satisfied and he sent soldiers under Tartan, Rabsaris, and Rab-shakeh to take Jerusalem. They shouted to the Jews on the walls warning them. In vs 21 he says not to trust on the "staff of this bruised reed, even upon Egypt"..., and then in vs 22 "But if you say unto me, We trust in the Lord our God: is it not that he, whose high places and whose altars Hezekiah hath taken away and hath said to Judah and Jerusalem, Ye shall worship before this altar in Jerusalem.?" In this they distorted the True God and false gods. Then in vs 29 "Thus says the king, Let not Hezekiah deceive you: for he shall not be able to deliver you out of his hand; Neither let Hezekiah make you trust in the Lord, saying, The Lord will surely deliver us, and this city shall not be delivered into the hand of the king of Assyria"... vs 35-36 "who are they among all the gods of the countries, that have delivered their country out of mine hand?" What arrogance by king Sennacherib. "But the people held their peace, and answered him not a word: for the king's commandment was. saying, Answer him not."... 19:22, "And it came to pass, when king Hezekiah heard it, that he rent his clothes, and covered himself with sackcloth, and went into the house of the Lord." He had other priests and elders place sackcloth and then notified the prophet Isaiah. He, Isaiah, said in vs 6-7, "And Isaiah said unto them, Thus shall ye say to your master, Thus saith the Lord, Be not afraid of the words which thou hast heard, with which the servants of the king of Assyria have blasphemed Me. Behold, I will send a blast upon him, and he shall hear a rumor, and shall return to his own land; and I will cause him to fall by the sword in his own land." Note that bold and underlining put in by myself JGL. From KJV of Bible. The ASSYRIAN ACCOUNT is found on the Taylor Cylinder B, lines 31-58; and fragments of Cylinders C and D; the Bull Inscriptions, No. 2 and 3 and several others. The sections with some variance are in ( ). On the Taylor Cylinder Col. II and III lines 11-20: "And Hezekiah of Judah who did not submit to my yoke, of his strong cities, fortresses, and small cities which were round them, which were without number, (with the marching of a host and surrounding of a multitude, attack of ranks, force of battering rams, mining(?) and missiles) I besieged, I captured, 200,150 people, small and great, male and female, horses, mules, asses, camel, oxen, and sheep, which were without number, from the midst of them I brought out and as spoin I counted. Him like a caged bird within Jerusalem his royal city I had made, towers round him I raised..." ...Line 32 "and (they inclined to submission) with 30 of gold, 800 talents of silver talents..." Line 40 " he sent, and to give tribute (and to make submission), he sent his messenger." From: History of Sennacherib Translated from Cuneiform Inscriptions, George Smith Ed. A.H.Sayce, Williams and Norgate, Edinburgh, 1878. Note: It is well known that the Assyrians did not recount their defeats, and may have confabulated their victories, thus the Assyrian account does not mention the failure in overcoming Jerusalem during Hezekiah's time.